Making miniatures with polymer clay is simple in that anyone can work in polymer clay--it doesn't require a studio, special equipment or a special oven. However, the designs that can be made in polymer clay range from the simple to the incredibly intricate and you are bound only by your imagination and your artistic skill. The most popular type of miniatures made from polymer clay are usually food items, but polymer clay can also be used to make anything from people to furniture to garden stones and plants. Soften polymer clay in your hands and mix colors if needed to achieve the right shade. Roll out the clay with a pasta roller or rolling pin. Cut out the shapes you need and use a utility knife, toothpicks, scissors, buttons, stamps or molds to stack, texture or otherwise design your miniature. Rub chalk pastels on a piece of paper and use a paintbrush to dip into each color and mix colors if needed. Apply chalk pastel color to the polymer miniature where needed to add color and dimension. 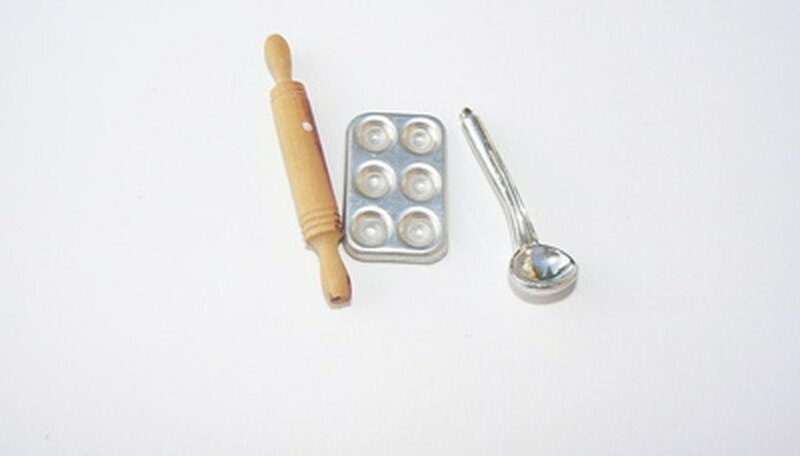 Bake your miniature as per the clay manufacturers' instructions in either your oven or toaster oven (usually 250 to 275 degrees Fahrenheit for 10 to 20 minutes). Remove the miniature and let it cool. Coat with polymer clay glaze, if desired, and glue or add on any other embellishments that might be needed.